Fans of Eminem the actor are about to lose a battle to fans of Eminem the rapper. 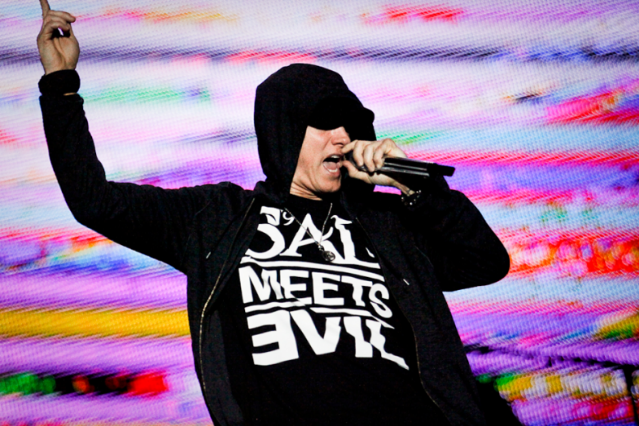 Following years of false starts with projects called scary things like Shady Talez, along with more recent news that he was working on a flick called Southpaw (which was essentially billed as 8 Mile But Boxers Instead of Rappers), Em and his camp have decided his efforts will be better spent, for the time being, doing what he does best: making music. In a report from the Detroit Free Press (via BeatsPerMinute), Em’s Interscope spokesman Dennis Dennehy announced that the project, which applied earlier this year for $8.9 million in “film incentives” from the state of Michigan (the movie will be eventually set in Detroit) and subsequently withdrew its application citing “a talent issue,” would halt production because the rapper “is focusing on his music right now,” referring no doubt to what will be Shady’s eighth studio effort, the follow-up to 2010’s Recovery. This is just the latest in a parade of hurdles Southpaw has faced since its negotiations began last year. Development was halted last August by Dreamworks, the movie’s original studio, and then was transferred a few months later to MGM and Sony, who took it over. As of right now, it’ll be directed by Antoine Fuqua, who also gave the world Training Day, and will still be filmed in Detroit, eventually. The acting moratorium, obviously, didn’t affect Eminem’s appearing in Ice-T’s strictly nonfiction Art of Rap documentary, which comes out next month, but for now, fans of sports movies starring musicians will have to settle for counting down to Usher’s still-greenlit Sugar Ray Leonard film.